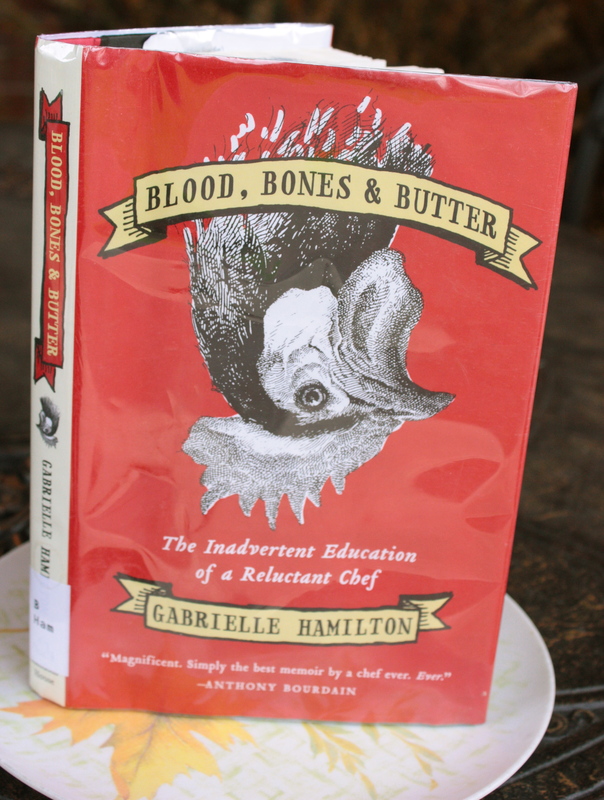 Books for Foodies: Blood, Bones & Butter by Gabrielle Hamilton | "Il faut goûter"
The book’s subtitle: The Inadvertent Education of a Reluctant Chef. Without flinching, Gabrielle Hamilton candidly pours onto paper the food-accented roller-coaster ride of her life. There is her upbringing by a French-born mother and artist father, her older youth as a strung-out server, summers as head chef at a sleep-away camp in the Berkshires, several years in the stifling New York catering business, a journey to Europe and the finding of roots, sojourns to Italy and her new Italian family, and eventually, the opening of a restaurant in NYC that bears her childhood nickname. Throughout this memoir, she seems to realize with shining clarity the impact food has had on her memory and on her very soul. All these places, not least her mother’s rustic well-stocked kitchen, have played a grand role in making her crave the flavors and textures that are her comfort foods and in setting her deliberate standards for good food: unadorned but rightly done. The lambs were arranged over the coals head to toe to head to toe the way you’d put a bunch of kids having a sleepover into a bed…The lambs roasted so slowly and patiently that their blood dripped down into the hot coals with a hypnotic and rhythmic hiss, which sounded like the hot tip of a just-blown-out match being dipped into a cup of water. My dad basted them by dipping a branch of wood about as thick and long as an axe handle, with a big swab of cheesecloth tied at its end, into a clean metal paint can filled with olive oil, crushed rosemary and garlic, and big chunks of lemons. He then mopped the lambs, slowly, gently, and thoroughly, back and forth with soft careful strokes like you might paint your brand-new sailboat. Then the marinade, too, dripped down into the coals, hissing and atomizing, its scent lifting up into the air. So all day long, as we did our chores, the smell of gamey lamb, apple-wood smoke, and rosemary garlic marinade commingled and became etched into our brains. I have clung to it for thirty years, that smell. I have a chronic summertime yearning to build large fires outdoors and slowly roast whole animals. I could sit fireside and baste until sundown. Hiss. Hiss. Hiss. I wish I had that childhood memory. So I came to possess, of all things, a husband. This didn’t make sense for the longest time, to anyone, myself included, but that was also before I met his Italian mother. Eighty-year-old Alda Fuortes de Nitto cooks eggplant that satisfies like meat, grows her own olives, peels apricots from her own trees, and sun dries tomatoes to make her own tomato paste. I adore her and our summer visits to her home in Puglia, at the tip of the Italian boot heel. I recommend this book to anyone who loves to eat with all the senses, who has a soft spot for culinary Europe, or who is interested in witnessing the gritty insides of catering and restaurant business. Now go and find this book if any of this delights you! This entry was posted in Books for Foodies and tagged book review, books, books for foodies, Cooking, food, Gabrielle Hamilton, review by needtotaste. Bookmark the permalink. Why thank you, I will pass it along soon! Cheers!